Africrest Properties intends to be one of the top 10 largest residential middle-income landlords in Gauteng within the next 5 years. Africrest has made huge strides into the residential market. A few years ago, Africrest made the decision to get into the middle-income residential property market and launched ‘Africrest Residential’. The company has been very active in converting old office buildings to apartments; developing new apartment buildings and purchasing existing apartment buildings. Africrest’s strategy is to retain ownership over the apartments and lease them out to the market. Grant Friedman of Africrest says “it has been a very exciting journey to get this far. While residential development has many more obstacles to commercial property investment, such as- zoning regulations, construction complexities and council restrictions, the process has been very rewarding. The feeling of giving new life to a building that has been sitting vacant is fantastic”. “From day one we made the decision to have an in-house property management team. This has been a major benefit as we can see how our vacancies and bad debt levels are significantly lower than many of those who outsource their management. Our team has developed the necessary skills to fill up the apartments once developed and maintain the buildings as wonderful, happy environments for our tenants to live in” comments Greg Blend. Africrest’s ultimate vision when looking at a development is to give tenants an environment that they can say that they are proud to live in. They always try and give tenants value for money with bigger apartments and better finishes than what other apartment buildings offer. Africrest believes this will create a more sustainable environment with tenants who will be more likely to renew their leases. Justin Blend comments, “we ask the question- is this an apartment that I would be happy for myself and my family to live in and the answer must be a strong yes”. Africrest’s aim is to provide affordable housing close to where their target market works so as to reduce commuting time and cost. The apartment rentals range from R4,000 to R7,500 per month. Currently under development is- The Village in Bramley; Stanley Studios in Milpark; Braamfontein Lofts (in partnership); Kent St. Apartments and The Landmark both in Randburg; and Simgos House in the Johannesburg CBD. Africrest has also successfully partnered with building owners who do not want to sell their vacant building at the low price of a vacant building but would rather JV with Africrest and participate in the upside of the buildings value post conversion. Africrest continues to look for new opportunities in the middle income residential market and their aim is to have at least R1 billion worth of residential property within the next 3 years. 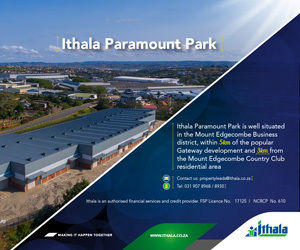 This is in addition to Africrest’s commercial property portfolio which continue to expand at a rapid rate.